Providing effective online training for your employees in an essential step in creating a company that runs smoothly with high levels of both productivity and profits. An important investment, relevant and well-designed on-the-job training not only improves productivity, but also increase worker retention, customer satisfaction, and creativity in product design while reducing problem-solving time and saving labor costs. 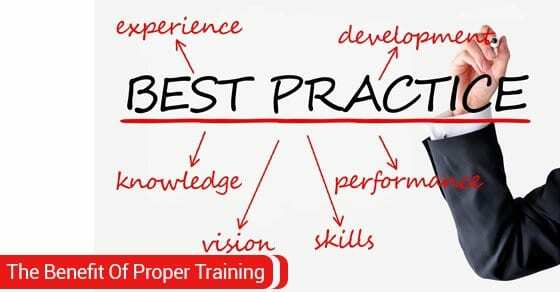 If you want to develop an effective and efficient workforce for your company, proper training from day one is an important first step. Spending extra money on adequate employee training can seem like a waste of money, but investing in your employees will actually improve your financial situation significantly in the long term. This is because insufficient training often results in poor employee performance, sub-par work, and wasted resources. If employees don’t know what they’re supposed to do or how to do it, they will waste large amounts of time and money in trying to complete their tasks. A properly trained employee is much more efficient, leading to fewer overtime hours and maybe even fewer employees. Training reduces the time spent correcting mistakes and the duplication of labor that commonly occurs when managers have to correct for poor performance. Furthermore, ensuring your employees are properly trained goes a long way in reducing equipment breakdown as well as customer complaints. Online training can further save time and money as an existing employee doesn’t have to guide the new employee through their new tasks. This will give all existing employees the opportunity to continue their day uninterrupted, while still giving the new employee ample time opportunity to learn the ins and outs of their new position. It has been shown that job satisfaction and self-esteem often go hand-in-hand, and both are improved when employees understand the workings of their company and the expectations of their job. Effective training improves job morale, boosting self-confidence as well as loyalty to the company. In fact, good training and opportunities to improve or learn new skills has been shown to prevent employees from seeking new job opportunities! A high employee turnover rate can cause a myriad of problems for your company both fiscally and in terms of general employee morale. Separation costs such as exit interviews, severance pay, processing termination, and unemployment compensation are added to the replacement costs of advertising the job, interviewing/testing applicants, medical exams, and employment information to create a large financial drain on the company. At the same time, seeing co-workers constantly leaving and being replaced around them tends to reduce job morale and productivity in other employees. By keeping your employees well-trained and happy you can significantly lower your turnover costs and instill confidence in your workers.